You may remember Commander Video as an unlockable character in the brutally rewarding Super Meat Boy but before that he was the star of the Bit.Trip games. Originally released on WiiWare these six games have a distinct and overt retro feel while still being, for all intensive purposes, rhythm games. Of the six only the two book ends, Bit.Trip Beat and Bit.Trip Flux, are similar with each one resembling pong, albeit pong after a heaping dose of peyote, with the paddle in Beat being on the left side of the screen while the Flux paddle is on the right. The other four games are entirely unique. 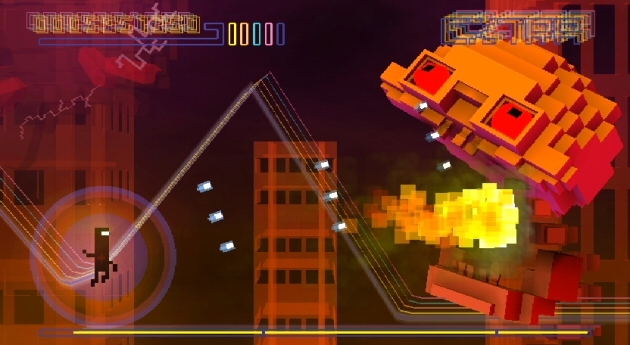 In Bit.Trip Core you use the d-pad to fire a laser and destroy bits as they fly toward the screen. While this sounds simple the patterns will get confusing and over bearing quickly. You must be quick, but also patient and smart. As with all of the games in this collection repetition and pattern memorization is a must. 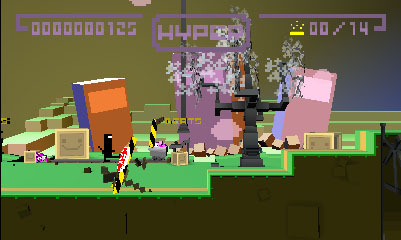 Bit.Trip Void’s risk/reward style of play has you collecting dark bits while avoiding light bits. The more bits you collect the larger you grow, and the greater your score will increase, but hit a light bit and it is back to your initial size. You can also manually revert back to your original size if things get too out of hand (and they quickly will). You float around the screen with the circle pad, free from any kind of movement impediment. Bit.Trip Runner has you take on the role of Commander Video who will perpetually run throughout the levels and you instruct him to jump, kick, block, slide and spring through each level. If you miss a ledge, run into a wall, or anything stops your forward progress you are immediately warped back to the beginning of the stage. There are gold bars to collect in each of the non-boss levels, collect them all in a stage and you can play an even more retro version of a Bit.Trip Runner stage and rack up the points. Bit.Trip Fate has you controlling Commander Video once again, but this time he is on a rail as you traverse through space, avoiding obstructions, bits and foes alike. The circle pad moves the Commander on the rail and you aim and shoot with the stylus. The better you do the more instrumental the music becomes, with layers being added to heighten the experience. Start to lose grip though and you’ll hear the music recede back to a more simplistic form, and if you don’t catch back up to the beat the screen will go black and white and the music will be nothing more than a single tone resembling that of a heart rate monitor. This is true for all of the games except Runner where the music (and a trail behind The Commander) will be determined by the number of power ups collected. The 3D varies from incredible to unnecessary to an annoyance. There are times in Runner that the 3D environment will look amazing, the depth of field will be perfect and everything will be clear as day and going smoothly, but then all of the sudden the frame rate will drop and you may lose the position of The Commander to the background colors. This cannot be placed entirely on the 3D however because this frame rate drop will happen in 2D as well and can ruin a great session. The levels are short enough so it doesn’t matter too much and you may only lose a minute or two of game play, which should just be regarded as a practice run. The short play times of these levels make it a great portable game and the variety inside these six games make sure that you’re never bored. If you’re starting to get sick of one style of game play, load up another one and enjoy the ride. It’s a shame that the extra levels included in the Wii version of this collection aren’t packed in here. It would have been a nice addition to it all but there is already hours of content on the cartridge. The content is addictive and you just may find yourself in a trance playing the same stages hundreds of times in a row to complete a perfect run, like the best puzzle games always make you want to do instead of need to do.